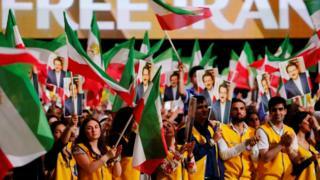 French officials say Iran's ministry of intelligence was behind a plot to bomb a rally of Iranian opposition groups in Paris in June. In a statement, the French government said it had frozen the assets of two senior Iranian officials. Iran insists the alleged plot is a fabrication, but has called for talks. In a possibly linked development on Tuesday, police in the French city of Dunkirk raided a Shia Muslim centre that has close ties to Iran. They made several arrests and froze the assets of the group. On 30 June, Iranian opposition supporters gathered in Paris for a meeting of the National Council of Resistance of Iran (NCRI). Guests included US politicians Newt Gingrich, a former House speaker, and Rudy Giuliani, President Donald Trump's lawyer. The NCRI is considered to be the political arm of dissident group Mujahideen-e-Khalq (MEK), which Iran has designated as a terrorist organisation. It later emerged that two Belgian nationals of Iranian origin - a husband and wife known as Amir A and Nasimeh N - had been arrested by Belgian police in possession of half a kilogram (1.1lb) of explosives and a detonator. In a series of co-ordinated raids another man, identified only as Merhad A, was arrested in Paris and is accused of being an accomplice. An Iranian diplomat based in Austria, Assadollah Assadi, was also arrested by police in Germany. German prosecutors say he is an intelligence agent who met the husband and wife team in Luxembourg where he ordered the attack and handed them the explosives. Austria stripped him of his diplomatic status after his arrest and Mr Assadi now faces extradition from Germany to Belgium for prosecution. On Tuesday, the French government said it believed that the Iranian intelligence ministry was behind the plot. It announced it was freezing the assets of two suspected Iranian intelligence operatives - believed to be Mr Assadi and Saeid Hashemi Moghadam, who a French diplomatic source said was head of operations at the intelligence ministry. In a rare joint statement, the French interior, foreign and economy ministers said: "This extremely serious act envisaged on our territory could not go without a response. Tehran again quickly denied any involvement, saying the alleged plot was "designed by those who want to damage Iran's long-established relations with France and Europe". "We deny the accusations and forcefully condemn the Iranian diplomat's arrest, and call for his immediate release," a foreign ministry statement said. But speaking later, ministry spokesman Bahram Ghasemi called for talks with France to clear up any "misunderstanding". "If there is a misunderstanding... about a thing that does not exist, be it a conspiracy by others or a mistake, we can sit down and talk about it," he told AFP news agency. Several people were arrested after police raided the headquarters of the Zahra Centre France and the homes of its leaders on Tuesday. Officials quoted by AFP said the assets of the centre were frozen. It is headed by Yahia Gouasmi, a French-Algerian who is known for his links to Iran and for his anti-Zionist views. Regional authorities said the operation was part of the "prevention of terrorism" procedures, but it was unclear if the arrests were linked to the Paris bomb plot.